It’s good for Broken Bones, Joint Pain & Arthritis, Bruises, Muscle Cramps or PMS Cramps, Sprains, Sports Injuries, Carpal Tunnel and Insect Bites. other Superstar Pain Product, Tiger Mom CBD Roller. We put Evil Bone Water on first where you are having pain, then we roll on the Tiger Mom CBD and . . .
BAM! It’s a 1 – 2 Punch to knock out pain. The Evil Bone Water gets in deep to the bone (or the joints) where the your pain is, and helps Tiger Mom CBD get in deeper and faster to provide pain relief. Both Evil Bone Water & Tiger Mom CBD are rich in anti-inflammatory properties while significantly reducing pain, helping the muscles feel looser and restoring Range of Motion to stiff joints and muscles. 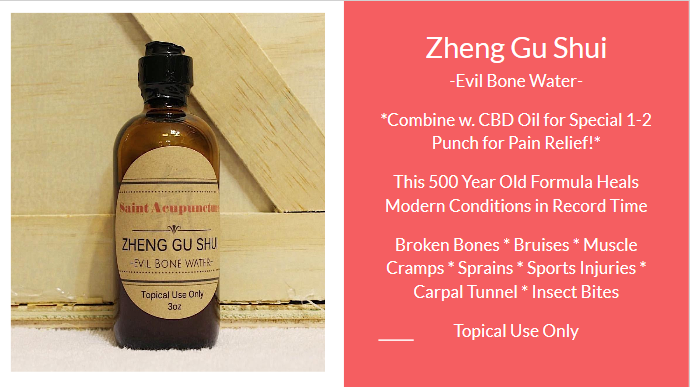 Make an Appointment today to demo Evil Bone Water and Tiger Mom CBD at Your Next Acupuncture Session!